After Donald Trump was elected the 45th president of the United States, angry supporters of Hillary Clinton, with many college students among them, took to the streets on both coasts to express their dissatisfaction with the result of the vote. Some of the largest protests happened on the West Coast, with crowds marching through California's Oakland, Berkeley, Los Angeles and San Francisco. Students from the University of California in Los Angeles (UCLA) and San Diego (UCSD) gathered in the streets until late at night, chanting "Not my president" and expletives such as "F**k Trump." At least 500 protesters gathered near UCLA, AP reported, citing police. Even larger crowds took to the streets from the Berkeley campus, with angry participants lighting flares and shouting similar slogans. 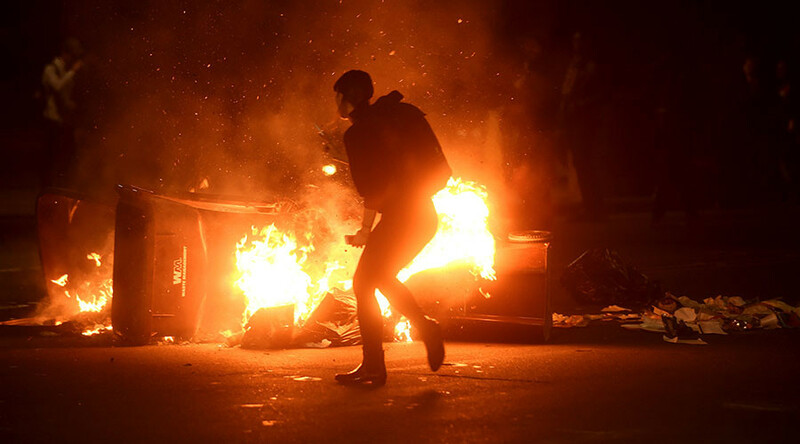 Demonstrations apparently got even more out of control in Oakland, where protesters smashed windows, set fires in the streets and burnt an effigy of the Republican winner, local television reported. In Oregon, one of the states that Clinton won, crowds blocked traffic in Portland. Streets in Eugene were also filled with people shouting expletives. In Seattle, Washington, police had to close a street after protesters blocked an intersection, USA Today reported. More than 1,000 people gathered outside the White House in the US capital to protest Trump’s victory, according to Fox News. Meanwhile, in New York prominent musician Lady Gaga, who was in Hillary Clinton’s camp, staged a one-woman protest outside Trump Tower, holding a sign reading "Love trumps hate."